Trends and insights from plenary gatherings are balanced with deeper learning from small group and intensive workshops. Issues of currency are explored in the context of the underlying principles of multicultural competence. Intellectual analysis is matched with emotional awareness. This unique Diversity Leadership Conference presented by NMCI and FWI, leaders in the field of diversity and inclusion, attracts a variety of diversity and multicultural professionals from nonprofits, national, state, and local governments, and corporations. Attendees, who are responsible for helping their organizations successfully navigate the increasingly multicultural landscape, participate in interactive dialogues that provide an environment fertile for cross-pollination of issues, ideas, and solutions. While diversity and inclusion are acknowledged by many as boons to creativity, innovation, and engagement, our ideological differences still get in our way. Partisanship is overshadowing partnership. Daily, we are bombarded by negative messages about differences. These realities shape our individual, and at times group, perceptions. “Us and they” still exists, and the work of diversity and inclusion champions is critical to finding pathways through these confusing and turbulent times. NMCI and FWI‘s fall 2010 Diversity Leadership Conference, Navigating Differences in a Changing World: Dialogues on Diversity, Culture, and Identity, focuses on the power of dialogue in soothing, navigating, and leveraging the vortex of our nation’s dynamic shifts in demographics, in perspectives, and in experiences. General Sessions – The fall 2010 conference offers four large group events – four Keynote Speakers (Joe Watson, Kevin Jennings, Neely Tucker, and Evelyne and Arthur Matthews). Large group learning offers insights from diversity and inclusion leaders, learning from peer participation, and networking opportunities. FWI Diversity Dialogues – Developed as part of The FutureWork Institute’s commitment to help its clients take a 360 approach to diversity and inclusion by moving forward into the future, Diversity Dialogues takes participants broader into issues of multicultural and multigenerational diversity, and deeper into the traditional issues of race/ethnicity, gender, and LGBT, among others. These three-hour sessions are intended to help participants take a meaningful look at important issues and use the dialogue methodology to engage in more courageous conversations in order to move our diversity and inclusion work to a new level. NMCI Diversity Leadership Workshops – NMCI’s rigorous one- and three-day workshops are devoted to the multiple dimensions of one central topic which is presented in a safe and dynamic atmosphere. These one- and three-day programs serve people at all points on the cultural competence continuum: from individuals interested in developing a diversity and inclusion foundation to professionals ready for the next level of organizational capacity building. All workshops are built around NMCI’s proven framework, featuring four modules: Knowledge, Awareness, Skill-Building, and Action Planning. 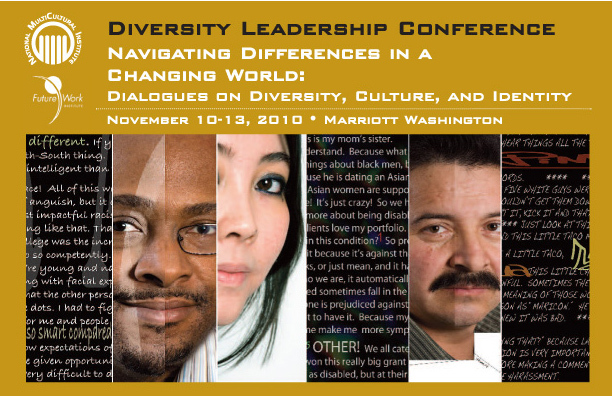 The Diversity Leadership Conference draws national and international emerging and established leaders in diversity and inclusion. Professionals dedicated to diversity and inclusion who work in the nonprofit, education, government, and corporate sectors attend, including diversity practitioners, human resource professionals, trainers and consultants, and other managers and administrators who are active, or interested in, creating a more inclusive world. The photographic portrait featured above is a composite from an exhibition by Kay Chernush called “The Us and The They: Prejudice and Empathy in America’s Smallest County.” The work explores in images and words how we see ourselves, how we see others, and how the “Other” sees us. In this perceptive new series, photographer/artist Kay Chernush, from Arlington, Virginia, turns her lens on a diverse group of Arlingtonians, holding up a mirror to the prejudice and stereotypes they have experienced in their everyday lives. Pictured above are Christian Dorsey, Mimi Xang Ho, and Tomas Lopez. © Kay Chernush. All Rights Reserved. Upon completion of any of NMCI’s workshops, participants will receive a certificate of attendance from the National MultiCultural Institute. CEUs are available to counselors, pscychologists, and social workers, as approved by NMCC, MD Board of Examiners of Psychologists, and NASW. The fee is $25. Send this link to your friends and colleagues. Experience NMCI’s Diversity Leadership Institute! NMCI Conferences from National MultiCultural Institute on Vimeo. Certified Coach, Flow 1, Boehringer Ingelheim Roxane Inc. In 2008, the National MultiCultural Institute and FutureWork Institute formed a strategic alliance bringing together proven leaders in the field of diversity consulting and training. The core competencies of both organizations include strategic consulting, organizational assessments, training, coaching, and research. This partnership marked the first time a leading global diversity consulting firm has aligned with a leading non-profit. The National MultiCultural Institute (NMCI) is a private, nonprofit organization founded in 1983 whose mission is to work with individuals, organizations, and communities in creating a society that is strengthened and empowered by its diversity. Through its programs, NMCI leads efforts to increase communication, understanding, and respect among diverse groups, and addresses important issues of multiculturalism facing our society. In addition to its twice annual Diversity Leadership Conferences, NMCI provides Organizational Consulting and Training on diversity issues, publishes books and training manuals through NMCI Publications, and develops Leading Edge Projects in the field. The FutureWork Institute, Inc. (FWI), formerly the Global Diversity Practice of Towers Perrin, is a leading global diversity workplace consultancy with a strategic change management approach to diversity and inclusion. FWI counsels its clients to tie diversity to their business strategy and move their organizations forward by deepening their work on the traditional issues of race, ethnicity, and gender while exploring emerging issues such as generational diversity, career diversity, and religion at work. FWI clients have traditionally been Fortune 1000 companies and other large for-profit enterprises.